Here's a DAB radio with touch sensitive controls - and it's done in no-expense-spared style. Genus' Type-R is a serious proposition for the audiophile and has a considerable helping of bells and whistles. 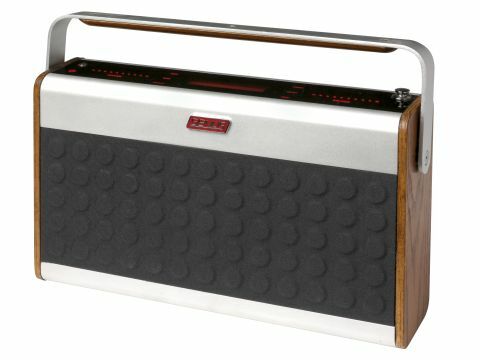 This beautifully designed digital radio's carry handle hints at portability, although special 'Type-R' rechargeable batteries must be purchased from Genus for this option to become reality. Besides, the Type-R is pretty heavy: leave it in the kitchen. But maybe not, because its touch panel quickly becomes covered in fingerprints because all the controls are operated by sliding a fingertip down a scale. Volume works identically, while scrolling between DAB stations works much like using a dial on an old fashioned radio - there's just no dial in sight. It's well designed because there's really not much to operate. Clean and streamlined, the two sliding scales - as well as tiny controls for accessing menus and making presets - glow red for about thirty seconds after use before dimming. The use of red makes controls easier to locate, but there's still the same problem with the LCD screen. A two-line, red-on-black affair, it's too small to read properly and has a poor viewing angle, making it hard to read from the side. But for the Type-R, forgiveness comes easy. Firstly, it's got a line-in (for attaching an iPod), a line-out (for using with other speakers) and a headphones jack, showing off some nice versatility. Secondly, it's one of the best sounding DAB radios at this size. Rich in bass (thanks to its MaxxBass feature) yet without any muffling, voice radio is given extra gravitas, while music enjoys a fully rounded delivery. Brilliantly designed and with excellent sound, the Genus Type-R is an expensive, but nonetheless good value, DAB radio if you're in the market for something that will last for years. There are more expensive options out there with more features, but stunning build quality makes this a great option for the connoisseur.